I have 2 new, histroy prints over hunting with hounds/Deerhounds(?) in my collection. 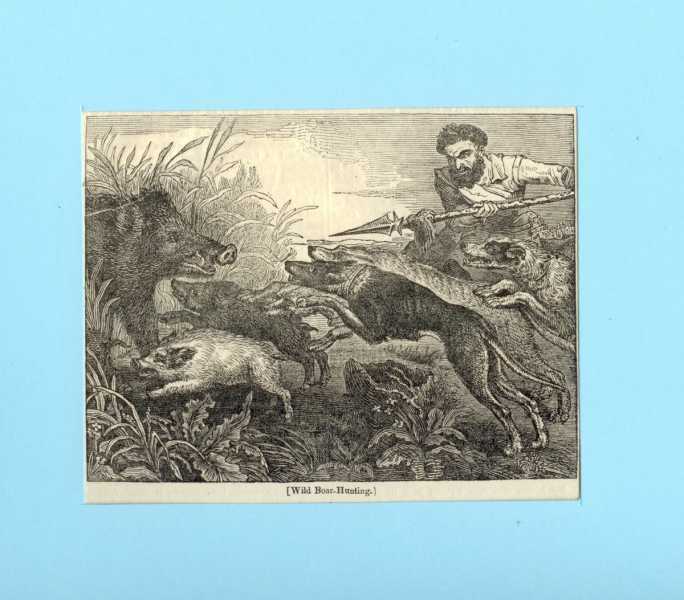 Method of print: Wood-engraving in the "Penny Magazin"
This is the second new, histroy print over hunting with hounds/Deerhounds(?) in my collection. Very nice prints Joerg. There was a Landseer print on US Ebay the otehr day! 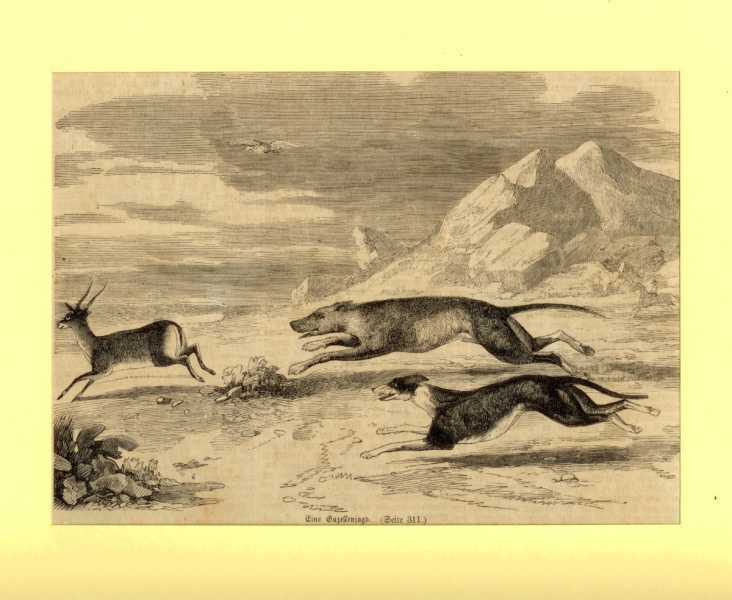 I think the hound over the Saluki or Greyhound is a Deerhound (?). The head is stronger, as by the hound in foreground. I have found in the internet on a Polish web site a very nice painting. Great collection you got - what's the name of the german book which contained the 2nd print? Tasgall wrote: Great collection you got - what's the name of the german book which contained the 2nd print? Thanks Thomas for your question. I have only purchased the original print from the book and not the complete book. 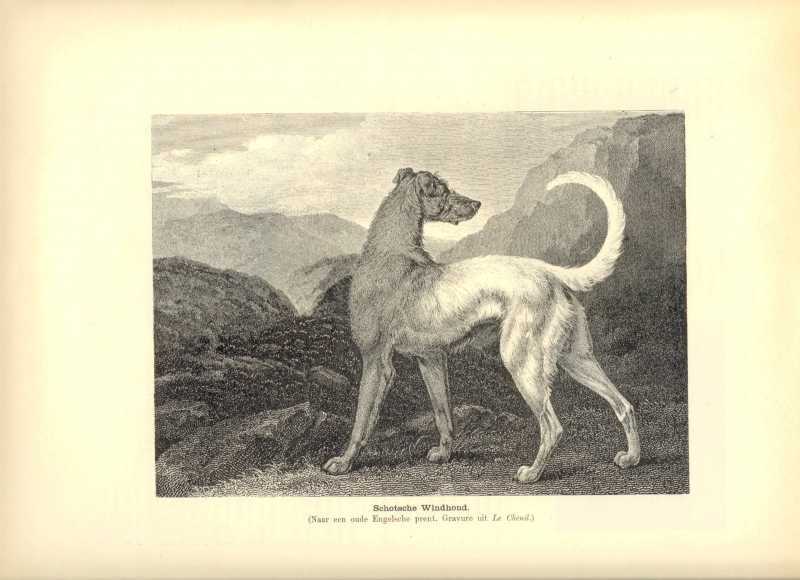 The title from the Ebay auction was "24534-Hunde-Dogs-GREYHOUND-DEERHOUND-WINDHUND--TH-1870" (is not more online). On the print is the title "Eine Gazellenjagd / Seite 311" . 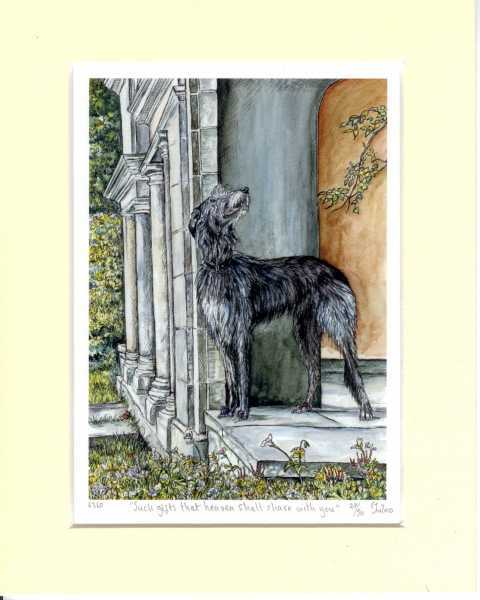 I have a new, histroy print with a Scottish Deerhound in my collection. I have this print from an Austrian dealer. Source: The print is from the book "Hunderassen". A very fine print Joerg, will look good on your wall. This isn't historical but you may like it. Last Edit: 8 years 3 weeks ago by Robb. Robb wrote: A very fine print Joerg, will look good on your wall. Thanks Rob for your friendly message and your link to the very nice print on "Darcys Web Party". Thanks again Rob for your link and information over "Darcys Web Party". I have won this auction and the money is for the research into Osteo. I think this was very good event from Bev and Darcy . Have all a very nice Sunday. I have now received the print of the auction from "Darcys Web Party" for the research into Osteo. 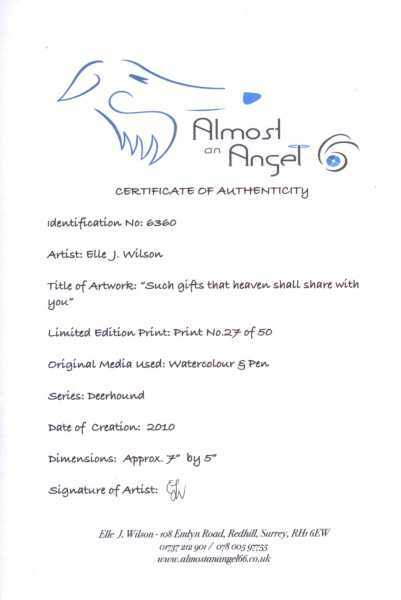 It is very nice print in Limited Edition of only 50 pieces worldwide. I have the number 27. Last Edit: 7 years 10 months ago by Joerg Yoki. Oh this one is beautiful indeed Joerg. Very sweet. Do you hang these prints and paintings on your walls? Your home must resemble an art gallery with all these treasures! Ironstone wrote: Oh this one is beautiful indeed Joerg. Very sweet. Do you hang these prints and paintings on your walls? Your home must resemble an art gallery with all these treasures! Yes, on the most walls in our house are prints, paintings and plates with hound motives. Many greetings on you all in BC. You must have a fantastic collection, have you ever thought of having a website and exhibiting your collection on-line for us all to view? Our sole picture is a limited print of Deerhounds at Castle Stalker by Lynn Paterson which we hang proudly in our entrance hall. 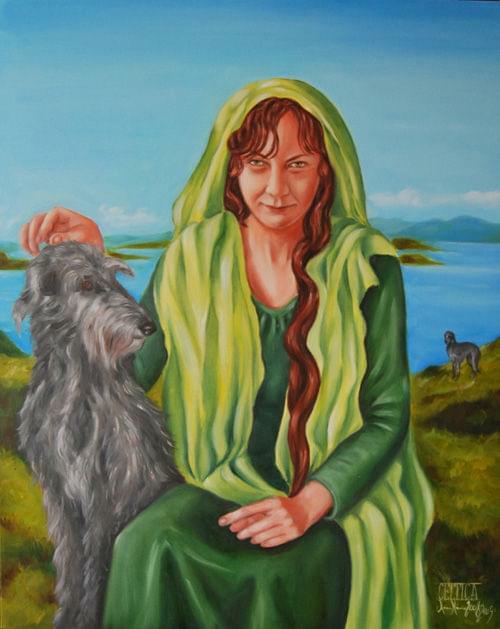 Great idea, unfortunately I have not a private web site, but I will post new pieces from my Scottish Deerhound collection in the history category of this forum.